With rain pouring down at the Jawaharlal Nehru Stadium in Kerala, Jamshedpur FC took on Kerala Blasters in the 48th match of the tournament in hopes of getting back into the top 4 of the league standings. Both sides came to this match on the back of a nil-nil draw against NorthEast United FC and Chennaiyin FC respectively and were desperate for a win in this match. Kerala Blasters FC, having not won a single home match this season had a lot to care about as they ended their three-match losing streak with a draw in the previous one and faced a desperate situation at eight points in nine games. Jamshedpur FC, on the other hand, looked to better their win record which is just three in 10 games. Even though they have lost just one game, they have lost 12 points in six drawn games, the most by any team in this season of the league. Both the teams started the match with much caution to avoid any injury during the game. 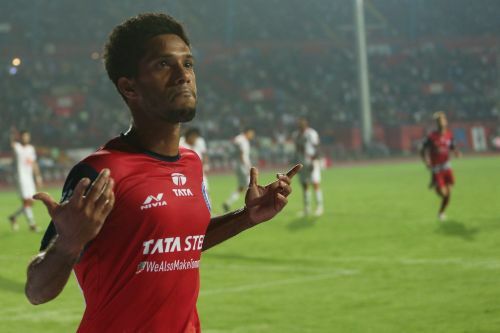 However, if not for the rains, the injury did hit for both sides as Jamshedpur’s Micheal Soosairaj had to be subbed off because of a pulled hamstring in as early as the 12th minute of the game. The other injury again came in the first half as Blaster’s Keziron Kizito pulled a muscle and had to be replaced by Courage Pekuson in 40th minute. 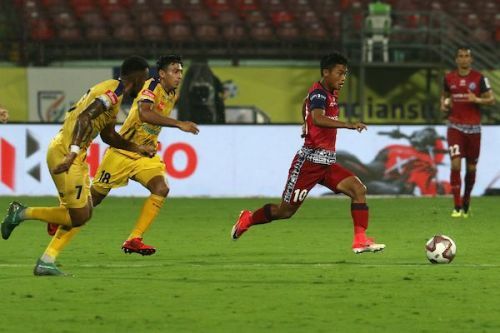 The first breakthrough came in the form of a penalty for Jamshedpur FC which was converted by a calm finish by Carlos Calvo in the 66’ minute of the game. An equaliser came in 11 minutes later by Seminlen Doungel who poked the ball into the net amid a lot of confusion in front of the goal. Even with a fair amount of chances during the match both the teams failed to add up to the goals column and the match ended in another draw in the competition. With that, both Jamshedpur FC and Kerala Blasters FC stayed at their respective places in the table and have much to worry about going into the second half of the season. Here are the 5 Talking Points of the game. Jamshedpur FC received a massive blow early on in the match as winger Micheal Soosairaj had to be subbed off because of a pulled hamstring. In the 12th minute of the match, Micheal Soosairaj felt some discomfort and consequentially sat down on the pitch while holding his leg in the run of play. Eventually, after his treatment by the doctors, it came to a conclusion that it’s a hamstring injury and that Soosai was in no condition to play a further role in the match and was replaced by Jerry. Soosai has been a key man for the men of steel this season and his presence till the full 90 could have been pivotal in terms of pulling out on a result for the visitors. In the post-match press conference Coach, Caser Ferrando did reveal that it will be until January at least that Soosai can make a return to the squad. Jamshedpur FC will be very disappointed to loose Soosai as they have already lost a star performer in Cido who is also not available till the end of the year. The good news for Jamshedpur FC is that they play only one match before the new-year to Delhi Dynamos FC at home. ISL 2018-19: 3 Games for Racism, 6 Months for Dissent - AIFF Setting Wrong Precedent with Carlos Calvo, Zakeer suspensions?